Hugh Ramsay's keen insight into character and poetic sensitivity to colour and scale, coupled with his remarkable technical virtuosity, made him one of Australia's most important portraitists. From an early age his precocious talent held the promise of a fine career, but Ramsay had a tragically short life. He contracted tuberculosis in 1902 and died at the age of 29. 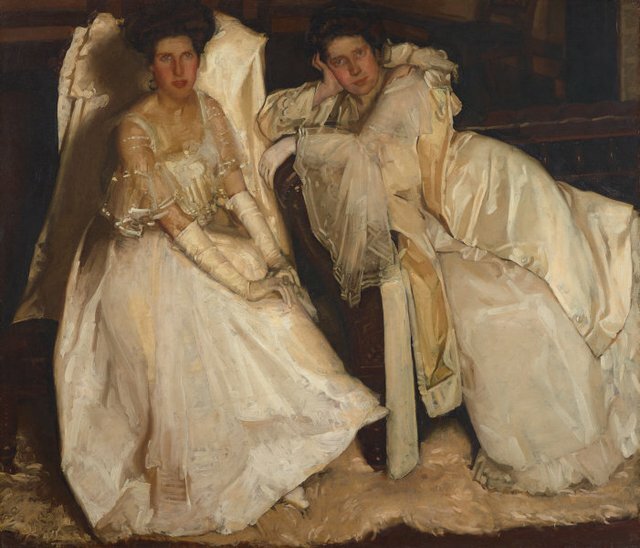 'The sisters' was painted after a two-year sojourn in England and France, with the influence of Velásquez and John Singer Sargent evident in Ramsay's vivacious paint handling and the shimmering fabric of the dresses, which he has captured to great effect. It is also an interesting autobiographical painting, a composite portrait of his three sisters, Madge, Nell and Jessie.